Today I thought I would share with you one of my biggest loves: Studio Ghibli films. For those of you who may not know Studio Ghibli is an award winning Japanese animation studio responsible for many critically acclaimed films such as: Princess Mononoke and Spirited Away. I've been in love with these films for about 5/6 years now, ever since I was very ill and off college. The TV channel Film 4 was having a Studio Ghibli week and I got to see several of these amazing films. There are many things to love about Studio Ghibli films, they touch you on so many different levels . They definitely are films which impact people in such a huge way that the become part of who they are. I know they did for me. First of all, the animation is stunning. Each one of the films is a work of art, you can see how much time and effort is poured into each frame. Though the animation has become more and more assisted by computers over the years it still remains beautiful and amazing to watch. Maybe the thing that makes Studio Ghibli films so special are the characters. Across the films no two characters are the same; there are cute characters, creepy characters, sweet characters and so on. The thing which makes Studio Ghibli characters so interesting is that none of them are depicted as perfect, unlike the older original Disney princesses, no Studio Ghibli charter is without their flaws. Hayao Miyazaki (director of many of the films and co founder of the studio) dislikes the idea of good vs evil and thinks that anyone has their good characteristics and their bad ones. The characters are very memorable, chances are even if you have never heard of Studio Ghibli you'll recognise Totoro (below) who has become one of the most marketable charters of all time. 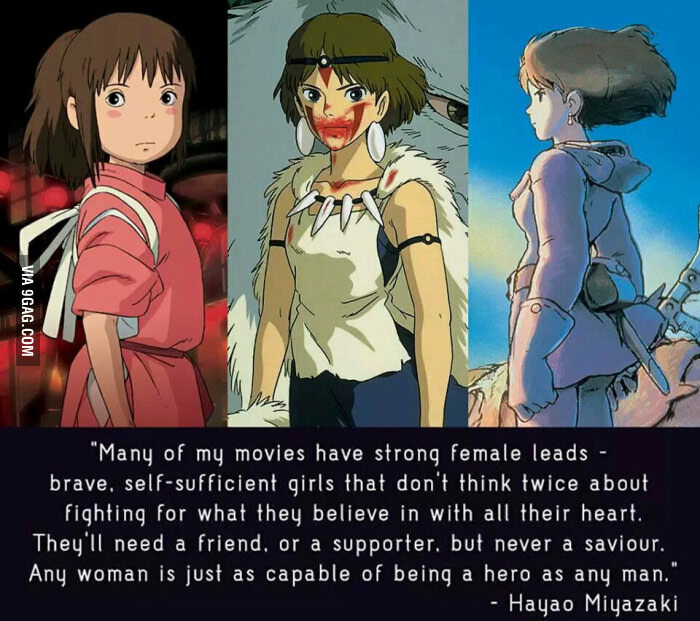 Studio Ghibli also should be admired for including strong female leading characters in so many of their films. 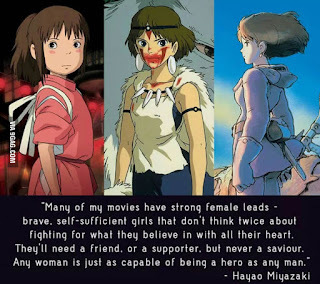 Hayao Miyazaki believes in depicting women and girls who are just as capable as men and who don't need to be rescued. That's why these films should be watched by young children so that the can watch animated films with strong female role models. The stories are also part of why I love these films so much. The stories always have a deep message and are, more often than not, extremely relatable. For example, I relate to the stories of Kiki's Delivery Service and Whisper of the Heart which are, to a certain extent, about figuring out who you are, what you want and where in the world you feel you belong. If you haven't watched any Studio Ghibli films I can't recommend them enough. Don't be fooled by the fact that they are animated, these films are as much for adults as they are for kids. I was going to do a Top 5 but I just couldn't do it, each film is special and brings something new to the table. I hope you enjoyed reading about why I love Studio Ghibli films so much and that it made you want to watch them. Do you like Studio Ghibli? What films are your favourites?